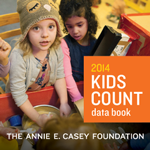 The Annie E. Casey Foundation regularly publishes research and policy reports, including the KIDS COUNT Data Book, based on data featured on its KIDS COUNT Data Center. The most recent publications are listed below. 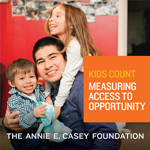 Access KIDS COUNT publications on the Annie E. Casey Foundation website. In this data snapshot, the Casey Foundation examines how placements for young people in foster care have changed from 2007 to 2017. Using data from all 50 states and the District of Columbia, Casey finds that child welfare systems are doing a better job of placing kids in families. At the same time, racial disparities persist for kids of all ages and progress eludes teens in care. 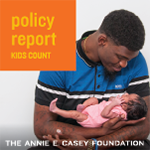 This KIDS COUNT policy report reminds policymakers and child advocates of the barriers that young families face, spotlighting a population of more than 2.9 million young parents and 3.4 million children nationwide. The report examines national and state-level trends — highlighting areas of opportunity and concern — and then shares potential solutions that can help these families thrive. 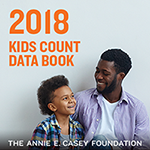 The 2018 KIDS COUNT® Data Book warns that the 2020 census is mired in challenges that could shortchange the official census count by at least 1 million kids younger than age 5. This discrepancy would put hundreds of millions of federal dollars at risk and, in doing so, underfund programs that are critical for family stability and opportunity. The Data Book also looks at trends in child well-being over a period of six or so years — a time that saw continued improvement in economic well-being but mixed results in the areas of health, education and family and community factors. 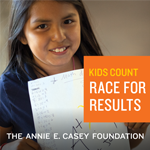 The report features updated data for the Race for Results Index, which measures how children are progressing on key milestones by race and ethnicity at the national and state levels. The report also explores the significant barriers facing children in immigrant families, the majority of whom are also children or color, and offers recommendations for helping children in these families secure the stability, economic resources and opportunities all of the nation's children need to thrive. 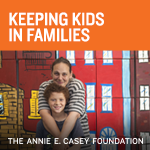 The Annie E. Casey Foundation urged policymakers not to back away from targeted investments that help U.S. children succeed. The 2017 KIDS COUNT Data Book also shows the child poverty rate in 2015 continued its drop. In addition, children experienced gains in reading proficiency and a significant increase in the number of kids with health insurance. However, the data indicate that unacceptable levels of children living in poverty and in high-poverty neighborhoods persist. 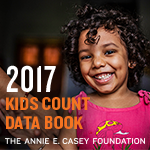 The Annie E. Casey Foundation's 2016 KIDS COUNT Data Book finds today's youth — Generation Z — are healthier and completing high school on time despite mounting economic inequality and increasingly unaffordable college tuition. Aided by smart policies and investments in prevention, a record number of teens are making positive choices. This year, the annual report focuses on key trends in child well-being in the post-recession years and offers recommendations for how policymakers can ensure all children are prepared for the future. More than 5 million U.S. children have had a parent in jail or prison at some point in their lives. The incarceration of a parent can have as much impact on a child’s well-being as abuse or domestic violence. But while states spend heavily on corrections, few resources exist to support those left behind. 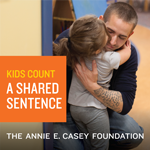 A Shared Sentence offers commonsense proposals to address the increased poverty and stress that children of incarcerated parents experience. 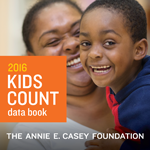 The Annie E. Casey Foundation’s annual report on child well-being — the 2015 KIDS COUNT Data Book — focuses on the state of America’s children in the midst of the country's economic recovery. While data show improvements in child health and education, more families are struggling to make ends meet, and a growing number of kids live in high-poverty neighborhoods. In addition to ranking states in several areas of child well-being, the Data Book also examines the influence of parents’ education, health and other life circumstances on their children. 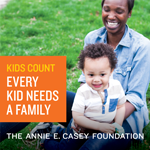 This report highlights state data that point to the urgent need to ensure that everything possible is being done to find loving, nurturing and supported families for children in foster care. The report also highlights the ways that state and local government leaders can work together as they strive to help the 57,000 children who are living in group placements. The report recommends how communities can help parents and children within their own homes. And it shows ways in which residential treatment can help young people return to families more quickly. The federal government’s official poverty measure, created in the 1960s, fails to illustrate the effect of programs designed to help families succeed. This data snapshot highlights the Supplemental Poverty Measure (SPM), which captures the effect of safety-net programs and tax policies on families. By using the SPM, researchers have determined that the child poverty rate has declined from 33% to 18% as a result of these programs and policies. Child poverty rates using the SPM are provided for the nation and each state. Nearly half of the nation's families with young children struggle to make ends meet. This report makes the case for creating opportunity for families by addressing the needs of parents and their children simultaneously. 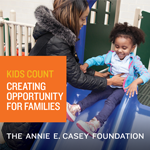 The report describes the Foundation's two-generation approach, which calls for connecting families with early childhood education, job training and other tools to achieve financial stability and break the cycle of poverty, and recommends ways to help equip families with what they need to thrive. 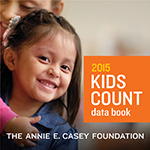 The 25th edition of Casey’s annual report on child well-being — the 2014 KIDS COUNT Data Book — examines how U.S. children have fared since 1990. While national and state policies have resulted in positive gains in child health and education, the Data Book notes a decline in the economic well-being of children and the communities in which they live. In addition to its retrospective analysis, the report looks at the latest data and uses 16 key indicators to rank states on child well-being. 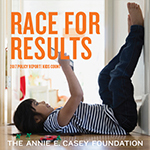 In this policy report, the Casey Foundation explores the intersection of kids, race and opportunity. The report features the new Race for Results index, which compares how children are progressing on key milestones across racial and ethnic groups at the national and state level. The index is based on 12 indicators that measure a child’s success in each stage of life, from birth to adulthood, in the areas of early childhood; education and early work; family supports; and neighborhood context. The report also makes four policy recommendations to help ensure that all children and their families achieve their full potential. 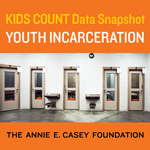 In its latest KIDS COUNT data snapshot, the Casey Foundation finds that the rate of young people locked up because they were in trouble with the law dropped more than 40 percent over a 15-year period, with no decrease in public safety. The snapshot indicates that the number of young people in correctional facilities on a single day fell to 70,792 in 2010, from a high of 107,637 in 1995. The publication also recommends ways to continue reducing reliance on incarceration and improve the odds for young people involved in the justice system. Nearly 6.5 million U.S. teens and young adults are neither in school nor in the workforce. With employment among young people at its lowest levels since the 1950s, these youth are veering toward chronic unemployment as adults and failing to gain the skills employers need in the 21st century. 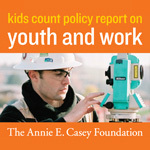 In addition to new national and state data on the issue, this KIDS COUNT policy report offers recommendations to support youth in gaining a stronger foothold in the economy. 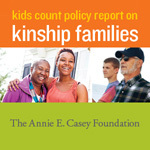 This new report reveals that extended family and close friends care for more than 2.7 million U.S. children. This longtime practice, known as kinship care, has become more prevalent over the past decade, with an 18 percent increase in the number of youths raised by relatives. In fact, an estimated one out of 11 kids will live with extended family for at least three consecutive months at some point before age 18.